Huawei Launched Huawei Watch GT globally last October, it was designed to deliver smartwatch capabilities while delivering amazing battery life. With over 1 million sold globally, HUAWEI WATCH GT has become Huawei’s best-selling smartwatch category. Today, Huawei Consumer Business Group announced the Active Edition and Elegant Edition during a launch event in Paris. HUAWEI WATCH GT Active Edition is fitted with a 1.39-inch AMOLED HD color touchscreen with a resolution of 454 x 454 pixels, while the Elegant Edition with a 1.2-inch AMOLED HD color touchscreen with a resolution of 390 x 390 pixels, offering you crisp and clear display. HUAWEI WATCH GT Active, Sport and Classic Editions feature two-week battery life with typical use including all-day wear and heart rate function activated, scientific sleeping function activated at night, 90 minutes of exercise per week and message notification. The Elegant Edition is up to one week. Used without exercise tracking in a more traditional watch scenario, the HUAWEI WATCH GT can stay charged for up to 30 days. The new HUAWEI WATCH GT Active Edition and Elegant Edition feature Triathlon mode. Three types of workout are supported under Triathlon, including open water swimming, outdoor cycling, and outdoor running. The smartwatch can record the entire triathlon, including the transition time. Triathlon mode will be available on the HUAWEI WATCH GT Classic and Sport Edition via an update. With ultra-long battery time and HUAWEI TruSeen 3.0 heart rate monitoring, the HUAWEI WATCH GT supports continuous 24-hours heart rate monitoring tracking active and resting heart rates. Combining innovative PPG optical and hardware design and AI algorithms, the solution can monitor the heart rate of users in real time with high precision. In Sport mode, the HUAWEI WATCH GT can be set up to notify individuals to adjust the intensity of their workout based on a pre-set target heart rate interval. In rest mode, the smartwatch automatically monitors and records the resting heart rate of users. TruSleep 2.0 scientific sleep tracking makes it possible to monitor your sleep quality, accurately identify typical sleep issues and offer you over 200 suggestions for improvement of sleep quality and personalized sleep services by real-time heart rate monitoring, sleep breathing and big data analysis, for better health management. 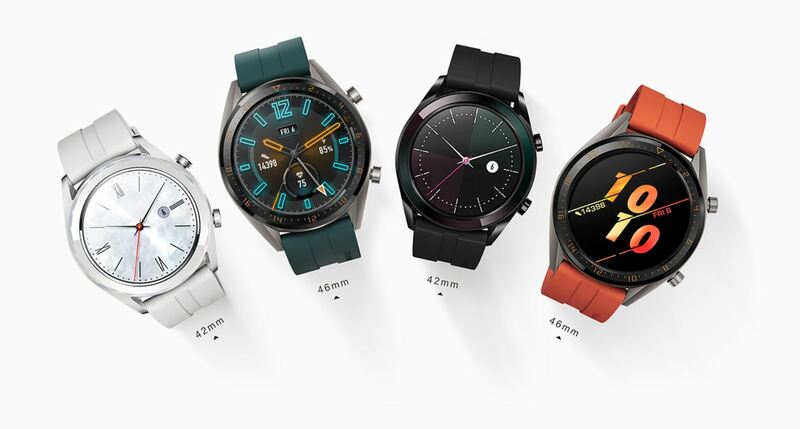 A variety of watch faces are provided in the HUAWEI WATCH GT Active Edition and Elegant Edition. Whether it is for a birthday party, workout, or work, you can always find one to suit the occasion. This feature will also be available for the HUAWEI WATCH GT Classic and Sport Editions after the update. The Active Edition is available in orange and dark green, and the Elegant Edition is available in black and white. As for pricing, the Huawei Watch GT Active Edition will cost 249 euros ($281) and the Elegant Edition will go for 229 euros ($258). Huawei has also showcased at Paris launch the new HUAWEI Band 3, which is fitted in with 0.95’’ AMOLED HD color screen for better display. Tailored for the young, the band also sports real-time heart rate monitoring, swim stroke recognition, scientific sleep monitoring, and other workout health functions.